Since October 2018, the country of Madagascar has become the victim of a new sanitary crisis and is suffering from a terrible measles outbreak. The Ministry of Public Health has declared over “19,000 cases of infection including 67 deceases from the October to December period”. 63 districts and 22 regions of the island are reported as impacted by the virus, including the capital Antananarivo (Midi Madagasikara, 2019). According to the ‘World Health Organisation’, “children aged 1 to 14 years account for 64% of the total number of cases”. Measles is considered as one of the most contagious diseases to human kind, although harmless in developed countries, it can become very dangerous for countries not benefiting from an adequate treatment. It is characterised by numerous symptoms being, high fever, cough, and the apparition of white stains originally inside the mouth which then spread all over the contaminated individual’s body (French Embassy of Madagascar, 2018). The challenge in tackling a measles outbreak is the late appearance of these symptoms enhancing the probability of transmission. In fact, the peak of contamination is understood to be four days prior to the appearance of white stains, fever can also appear only 10 days after the contraction of the virus. In other words, contaminated individuals are most often not aware of their health state at this stage. Contamination can happen in various ways, such as coughing, sneezing or any contact with nasal secretions. As a result, the virus spreads through the respiratory system and overtakes the patient’s body over the 10 to 12 days period of incubation (European Centre for Disease Prevention and Control, 2018). Despite the serious status of the disease, it often only plays a role of factor in the death of a patient. Indeed, it is the complications that hold the highest death rate. Amongst these complications, dehydration, brain swelling and pneumonia are the most serious and life–threatening (European Centre for Disease Prevention and Control, 2018). These complications result of numerous causes, the most frequent ones being malnutrition, most importantly low vitamin A intakes, weakened immune system due to the presence of other diseases such as AIDS, or the absence of vaccination for patients (French Embassy of Madagascar, 2018). These factors are omnipresent in Madagascar, consequently increasing the likelihood of mortality in the event of a measles outbreak. 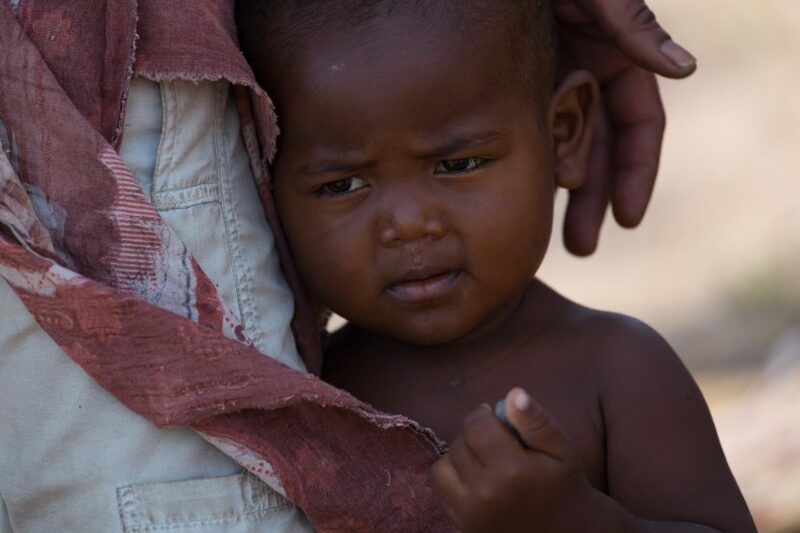 In 2018, ‘UNICEF’ declares chronic malnutrition as a major public health problem in Madagascar. It is the 5th most affected country with over 2 million children suffering (UNICEF, 2018). It is considered that 8% of children aged 5 years old or below are affected each year by severe malnutrition (UNICEF, 2018). In addition, the number of new HIV infections has tripled over the last two decades within the country (UNAIDS, 2018). Finally, despite the rise in vaccinations and the international efforts to raise awareness about the importance of the vaccinations, the vaccination rate stagnates at 80% (World Health Organisation, 2018). Although it represents a 23% improvement since 2017, this outbreak confirms the World Health Organisation’s concern stating that if the threshold of non-vaccinated individuals is above 10%, a risk of outbreak is inevitable. The measles outbreak in Madagascar is the painful reminder that the Right to Health is a constant battle for the Malagasy. Indeed, it is not the first sanitary crisis on the island. The country has faced some serious life damaging outbreaks with the plague or the poliovirus, and despite being eradicated, the awareness raising regarding health issues and the Right to Health in the country remains an issue (World Health Organisation, 2017). This new example demonstrates it once again, more needs to be done in order to promote and safeguard one of the most essential Human Rights. There exists a real need of supervision, assistance, education and communication. Weaknesses in the vaccination process, with stock shortages for adult patients, and a lack of awareness regarding the gratuity of the service appear as fatal. These issues must be tackled, consequently enabling the country’s vaccination rate to rise and avoid a risk of spread and outbreak. While the local government along with the support of international NGO’s work towards building a new campaign of vaccination available to all across the country, a need for awareness raising regarding the Right to Health remains present. Malagasy to this day, still do not get to freely enjoy that right. We, at Humanium, strive to defend the rights of every child in the world, by raising awareness of our cause, working directly in the field and changing mindsets.